Before we dive into the final part of the interview I want to take another moment to say thanks to Stulli and Valli for taking the time out of their busy schedules to talk to me and share some of their tasty beer. It was a privilege. Now onto the thrilling conclusion! 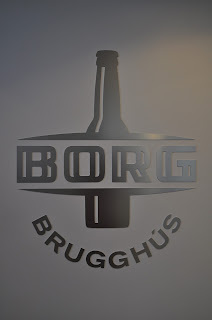 What particular beer do you feel best represents what you are doing here at Borg? What has been your best success to date? Valli: I think it is no question that it is Úlfur, the IPA, it put Borg on the map. Stulli: Yes, it is definitely best all around sales. It really surprised the marketing department. Valli: Ulfar is the first IPA in Iceland much to my dislike because I wanted to be the first one to bring it at Ölvisholt. Valli: It is the first IPA and it came out in 2010. Valli: It is the first American style IPA on the market in Iceland. We had a couple of imported English IPAs, more like bitter ales. Stulli: And really beat up Liberty Ale. Valli: Yes, just a couple months ago some guys started importing BrewDog and Mikkeller and you can now get those down at Micro Bar. We talked a little bit about how you are walking that fine line between craft brewing and that you have an industrial brewery backing you. How do manage that and still be able to produce these diverse, for Iceland, brews? Valli: It has been a process really. Stulli: It has been a steep uphill battle and getting the right people in the right places has really helped. Valli: We have managed to build up a reputation and people have finally realized that it is best to allow us to do what we want. Stulli: What we want is to introduce consumers to the wonders of beer and what the top floor sees is that we are increasing the positive reputation of the company. Valli: We are building up the name Egils and that is one of the many roles of Borg. For example we came out with a 12% imperial stout and it sold out in one day. Stulli: The beer culture being the state that it is, it is a prime opportunity to introduce to the people fresh beer in the style it is being approached in American and Europe. The small breweries, interesting styles, high gravity beers, and doing that in the best way possible so that the consumers get the best quality product as possible. How collegial is the craft beer community around here or are you all still just a small band of rebels? Stulli: Uh, I don't know (laughs). Stulli: …and we are lucky enough to get some of it in the market here because it is brewed here. Valli: There are four types of Einstok being made and we can't get one of them on a regular basis. Stulli: Yes, it is a contract brewing gig, Americans approached the people at Viking about contract brewing for them. Valli: But this actually also shows the quality of the brewmaster they have. He is working a very big system, well in comparison, and manages to pull out these beers with no experience producing anything like this before, so they can do it domestically if they want it. Stulli: Well they just marketed it in cans as their summer ale. Valli: Right, the white ale, he apparently made two different types of batches of it and the one that the Americans didn't pick Viking sold as their summer beer. What do you want people to know about Borg? Valli: Basically that we are making different types of beer. Stulli: We are trying to brew the best beer we can make, trying to make honest products, having fun. Valli: The big goal is to introduce different types of flavors. Get people to try new stuff. Essentially the easiest thing in Iceland is to be on the forefront of this movement because no one has done anything. Stulli: So it sort of makes it easy for us to introduce a lot of things because people just don't know any better, so when I say make things as honest as possible I mean we are trying to make proper styles, proper beers, proper flavors, and not necessarily to style but make interesting things and be honest about them. It's about quality.